One day as we were spraying an area that had its borders on the beach, a derelict fishing line in the lagoon caught the eyes of Matt, crew leader. A look with his mini binoculars that fit in our fanny pack, confirmed the presence of this entangled hazard in the reef which can harm the corals and entangle wildlife. Debris in the lagoon and at our shorelines comes from fishing boats and cities, existing at hundreds and thousands of miles away from our protected water…!! After we assessed the conditions safe to capture the debris, operations in the field stopped right away, as removing entanglement hazards is one of our top priorities on the island. Two people stayed on shore to watch the debris and other potential hazards as the presence of sharks and endangered species such as the Hawaiian monk seals and green turtles-can stop any operation. The other 4 persons, including myself, walked back to our camp to get swimming gear and items such as radio, handheld GPS, depth gauge meter, pocket knife, sunscreen, snacks, fins, goggles, extra layers, life vests, and so on. We would work until the entanglement hazards removed from the water and brought back to a secure location. Taking the boat out in the lagoon involves many preparation tasks so if we can use it, we utilize it to its maximum. We stage the marine debris that washes up at designated collection points around the island where some are accessible by wheelbarrow. If not, the boat comes in very handy. All debris collected pile up securely at the pier contained in super sacks and transported to Honolulu later, usually at the end of a season or when a willing vessel agrees to take it. For each debris removed, we record its location both collected and stored a brief description and its estimated volume and dry weight. While on the boat, your eyes can catch the presence of other marine debris and wildlife through this transparent interface that the lagoon offers. Have the camera ready because it is always quite a unique experience! 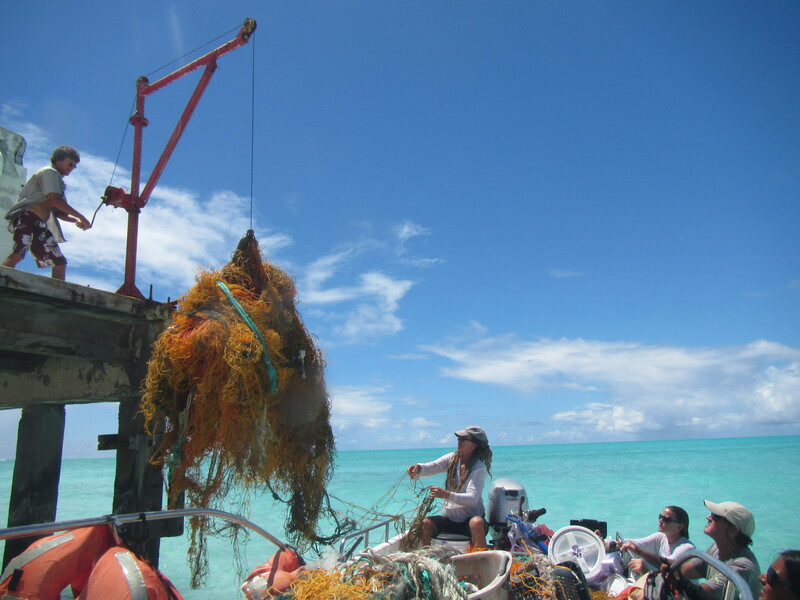 When we finally arrived at the designated location, a look from above revealed a one cubic meter fishing net which was not too entangled within the coral. Also, no wildlife entrapped. That was our luck to catch it before the situation got worse! We completed the removal in a few minutes with two people. You must stay away from the coral, float in the water, and cut the net from where the current is pulling it to avoid any wounds or damage to the coral. After disentangling the coral, we rolled the net into a burrito-shaped object and carried it to our boat, stationed closely. Matt, crew leader, was staying inside to look for any wildlife and to receive the net. Then, we toured the island and stopped at collection points to pick up as many debris as the boat could safely contain. After three hours of intensive work, the pile of trash on the boat reached shoulder height, made of various plastic crates, fishing nets, hooks, lines, and traps but also large FADs (Fish Aggregating Device) and buoys. Back at the pier, we unloaded the boat and carried the heavy hazards, full of sand and water, from the shore up to the pier. We carried some plastic crates inland to protect our out plantings in the field. Here comes the number that makes each of us very proud: we collected a total of 1050 lbs. of marine debris covering about 4 cube meters! Each of them one less threat in the ocean preventing entanglement to many wildlife species and individuals. We collected about 50% of the total debris staged on the island. More work to do! Every day, we see trash on Kure: light bulbs, lighters, toothbrushes, liquor bottles, shoes (often the right side! ), bottle lids, fishing net and weights, plastic bags, plastic containers, kid’s figurines, just to name a few. Not only do they exist in the lagoon and at our shorelines, but also inland-coming from+30 years of Coast Guard occupation-to items collected by seabirds, often red and black plastic, floating on the water mistaken for squid and flying fish parts. There is not one bolus (regurgitation from albatross chicks) or stomach content from carcasses that is free of plastic fragments. Birds die from its ingestion, regurgitation, and starvation. The noddies use the fishing debris as nesting materials which can entrap ground-nesting birds such as Red-tailed tropic birds. Not to mention that recently, we rescued two weaned monk seal pups from having their head and neck caught in a fishing net. They often constitute macabre objects of curiosity. Without our intervention, they would not have survived. It reminds us of our daily kuleana (responsibility) to care for our planet which comes with drastically reducing our waste consumption. The less the better if we look toward a sustainable and livable future for all earthlings. Well on a much happier note, we are now a team of 6 DLNR (Department of Land and Natural Resources) personnel with the addition of Matt Chauvin that arrived late June. He is called “Matt Geo” (which photographs might end up in Nat Geo magazine, just saying…!) and “Young” or “New” Matt, in relation to our older Matt, crew leader. Matt Geo is originally from Oregon. He studied Marine Biology at the University of Hawaii and currently lives in the Honolulu area. This is his second experience coming out to the North Western Hawaiian Islands as he spent his last summer on Laysan Island, working with Hawaiian monk seals. He loves the ocean, photography (of course! ), and being surrounded by birds and nature. New Matt will add daily efforts to restore our Green Island for a few weeks now. Our scheduled departure from Kure is at the end of August, time flies! Mahalo for following our adventures on Green Island!